The home at 405 S. Osprey Ave. was built for a local business owner and his family at the end of Sarasota’s boom years — the land boom of the 1920s, that is. The house was constructed circa 1925 in the Colonial Revival style that was common at that time across the country, although more atypical in Sarasota. It was larger than many of the bungalows and vernacular homes built around it, according to the Sarasota County Property Appraiser’s Office and historical records. It came to be referred to as the “Seven Gables” home for its eponymous structures — four along the front of the original metal-shingled roof and three at the back. In the late 1940s, the residence became a rooming house; later still, rental apartments. It was more than a year ago that an effort began to save the Seven Gables house. With that having proven unsuccessful, the structure faces demolition in March. 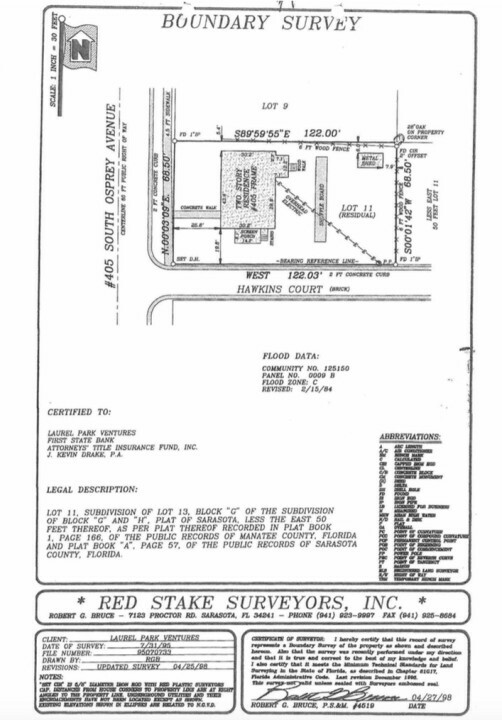 After the property at 405 S. Osprey Ave. sold in December, 2013 to The Rivolta Group — which plans single-family construction at the site — one of the previous co-owners, Devin Rutkowski, offered to move the historically designated, two-story house to land he owns just off Osprey Avenue. However, that proposal clashed with a City of Sarasota code provision meant to protect downtown trees, and it eventually pitted Rutkowski against the Laurel Park Neighborhood Association. Yet, it seemed like a good idea to some community residents: saving one of the “contributing structures” within the Laurel Park National Register of Historic Places Historic District; a house still standing from the boom years of the 1920s. Seven Gables still boasts a number of its original features, including weatherboard siding, a brick chimney and brick pier foundation. “In a city that has a sign out by the interstate that claims to have a historic district [Laurel Park], we scrape it away,” a visibly emotional Diana Hamilton, who lives near the Seven Gables home — and supported the effort to save it — told the Historic Preservation Board during a Jan. 12 meeting. Nonetheless, the board voted 3-2 to approve the demolition. It came down to three oaks. The effort to move the house was stymied by the discovery that relocating it by truck would necessitate the removal of three 18-year-old oaks. Furthermore, the city’s code for the downtown core required that the oaks be replaced with trees of the same size. The developer and Rutkowski, however, suggested planting trees with smaller diameters — which they argued would have a higher survivability rate and create less expense for them in the overall relocation cost — or landscaping. City staff ultimately ruled against the proposal for smaller trees, even though staff could have utilized a provision in the code that allows it to grant “up to 25% relief” from dimensional standards, as noted in an email Tim Litchet, director of the city’s Neighborhood and Development Services Department, sent to Rutkowski. City building officials, along with the Laurel Park Neighborhood Association, insisted that larger trees would have to be planted to replace the impacted oaks. The only way the city would allow a different size or type of tree was if the City Commission approved a Zoning Text Amendment to the City Code, Litchet decided. According to testimony representatives of The Rivolta Group and Rutkowski gave during city’s Historic Preservation Board meetings on Dec. 8, 2015 and Jan. 12, replacing the oaks with trees of the same size was a challenge for several reasons. Among those were the $15,000 cost, the type of equipment needed and the high volume of irrigation necessary to get a large tree to take root. “What they suggested was an impossibility,” Hamilton told The Sarasota News Leader in an interview on Feb. 23. A professional landscape gardener and designer, Hamilton said a significant factor was that the larger root ball of a 10-inch-diameter oak would be cramped in the 10-foot-wide median, decreasing the odds of the tree’s survival. “A 10-inch diameter tree has an 8-foot root ball … If those trees die, [Rutkowski] has to do it again, and if they die again, he has to plant them again,” Hamilton pointed out. However, residents of Laurel Park and board members of the neighborhood’s association emphasized that it was important for the developer and Rutkowski to adhere to the city’s code. “We said, ‘Wonderful. Move [the house], but we want [the trees] back as close as possible [to the previous size],’” Jude Levy, president of the Laurel Park Neighborhood Association, told the Historic Preservation Board on Dec. 8. During the Historic Preservation Board meeting, Levy was joined by other Laurel Park residents who voiced concerns. The issue comes down to the median and the vegetation that residents enjoy, said Juliette Reynolds, who has lived in Laurel Park for 27 years. Reynolds told the board that if the previous owner and the developer wanted to create a project that made a profit at 405 S. Osprey Ave., then they could pay to move the historic home and replace the oaks. Depending on whom you ask, the effort to save the Seven Gables house failed for different reasons. For Hamilton, it was because city officials and a neighborhood organization decided against working with someone who was seeking to move a historic home. “This wasn’t [an example of] government sitting down with someone to say, ‘How can we get this done?’” Hamilton told the News Leader. For her, saving the house would have been a demonstration project that could have been replicated, especially given ensuing downtown redevelopment. Nonetheless, during the Dec. 8, 2015 Historical Preservation Board meeting, Neighborhood and Development Services Director Litchet said he had to make a decision based on the impact on the median. “The point is we have a private developer who wants to impact city resources, something owned by the taxpayers, and we are trying to find that right balance,” Litchet pointed out. There was confusion, he continued, over the size of tree to re-plant in the median. “Initially, I was told by the city arborist that the 3-inch diameter trees would be what I would be required to put back,” Rutkowski told the board members. Further, he said he supported what he called a “best practice” mitigation plan for the undertaking, and his arborist told him a 5- or 6-inch diameter tree had the greatest odds of survival. Rutkowski added that he also did not understand why the Laurel Park Neighborhood Association board members would not allow him to present his plans for moving the home during a general meeting of the association. Additionally during the Dec. 8, 2015 meeting, representatives of The Rivolta Group, which purchased the property at 405 S. Osprey Ave., said 6-inch diameter trees were a possibility they felt could work. “We’ve done everything we can,” pleaded Renzo Rivolta. A 3-inch tree will take five to 10 years to provide a canopy again, Levy said during the meeting. 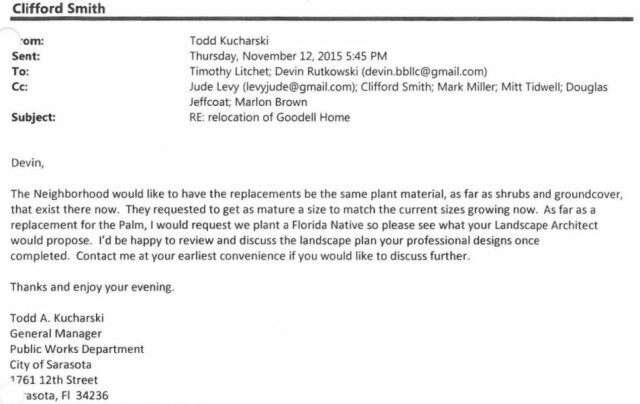 In an email to Litchet dated Dec. 15, 2015, Rutkowski withdrew his application to relocate the home. 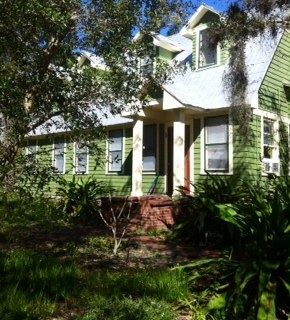 “Since the city doesn’t offer a single incentive for the preservation of this historic structure, and [because] the mitigation of the oak trees was paramount and conditional to the moving of the home, it became obvious to us that perhaps our priorities and objectives do not align with the city’s and the neighborhood’s,” Rutkowski wrote. Rutkowski noted that he had researched hiring a company to use a crane or a helicopter to move the Seven Gables house, but neither option proved viable. The structure is too heavy to be picked up by helicopter, and bringing in a crane would have cost $150,000, Rutkowski added. Relocating a historic home by truck is a common practice, but it often comes down to planning and economics, said Larry Kelleher, digital preservationist at Sarasota County Historical Resources. “It’s not hard to move houses; they are up on pier and beams. It is getting them out of the property and by power lines and trees that’s difficult,” Kelleher told the News Leader. A home can be cut into sections and moved, he noted, but that is much more expensive. With its weatherboard siding, brick chimney and brick pier foundation, the exterior of the Seven Gables home is in good shape, and the house itself is “quite large” compared to the other historic vernacular or bungalow homes that were built around the same time, according to a cultural resource assessment of the property undertaken in November 2015. The Seven Gables house was built between 1925 and 1929, according to one document regarding its historical significance; county property records put the date of completion in 1925. 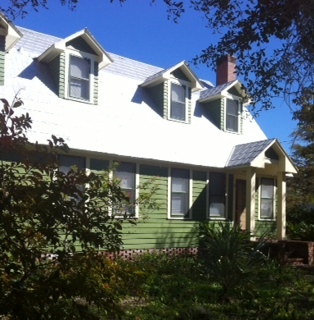 The home was constructed for Stiles Scott and his family, who moved to Florida in 1928, according to the cultural resource assessment. 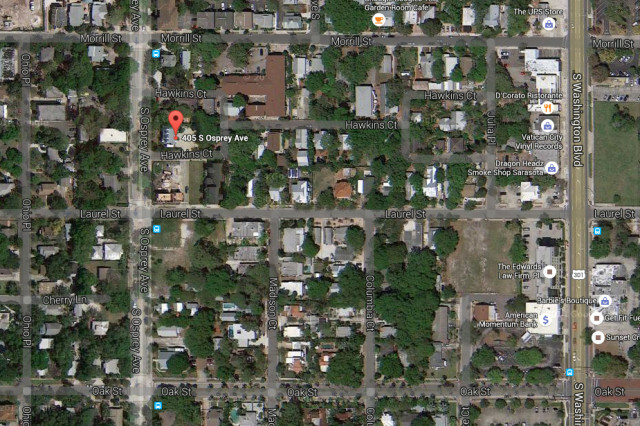 Scott owned several local businesses, including a drycleaners in Sarasota and a tackle shop in Venice. In 1946, he purchased the Fashion Cleaners in Clearwater, and the family moved to that city. His Sarasota home on Osprey Avenue was sold to James McLain Goodell and his wife, Mary “Mae” Goodell, according to the cultural resource assessment. The Goodells came to Sarasota from Charlestown, WV, in 1947. “By 1964, when Mary Goodell died a few years after her husband, their home was on Hillview Avenue,” the assessment continues. 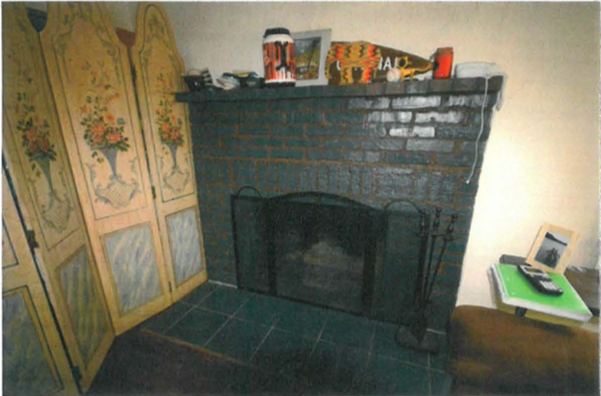 “Over the years, since late 1947, the subject structure has continually been in use as a multi-family dwelling unit. Sarasota City Directories indicate that the apartments were renamed and known as the ‘Cape Cod Apartments’ by 1971,” the assessment adds. Trees trump developers! There’s a glimmer of hope for SRQ.